Welcome to the Harold B. Lee Library and this extraordinary exhibition of ancient Roman military diploma plates, dating from 109 A.D. The bronze plates on display are some of the best preserved in the world. These plates, issued by order of the Roman emperor Trajan, are an example of double, sealed, witnessed documents. We hope you enjoy seeing and learning about these ancient Roman plates and the related artifacts in this exhibit. Perhaps the most compelling aspect of the exhibit is understanding what the plates tell us about ancient religious and legal practices as well as the preservation, validation, and authentication of ancient records and text. 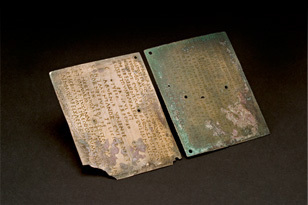 These two plates were issued by imperial decree on October 14, AD 109 during the rule of emperor Trajan in Rome. An extensive collection of research sources and further materials relevant to the exhibition have been gathered and are presented within this site to enhance your visit to the exhibit.